Banning smoking in public places could prevent hundreds of deaths from heart disease, according to a study in a small US town. Heart attacks in Helena, Montana, fell dramatically when smoking in public places was banned for six months last year. The number of admissions dropped to fewer than four a month - a fall of nearly 60%. Experts believe it was because people were protected from the harmful effects of second-hand smoke. In addition, smokers were encouraged to quit by the existence of smoke-free offices and public places. The six-month public smoking ban came into force in June last year but was suspended at the end of the year following a legal challenge. Researchers took advantage of the ban to study what happened to heart attack rates during this time using records from the local hospital. "This striking finding suggests that protecting people from the toxins in second-hand smoke not only makes life more pleasant, it immediately starts saving lives, said Prof Stanton Glantz, from the University of California at San Francisco, who analysed the results. "This work substantially raises the stakes in debates over enacting and protecting smoke-free ordinances." The study was revealed at a meeting of the American College of Cardiology in Chicago days after a similar smoking ban came into force in New York. The ban, which was implemented at midnight on Saturday (0500 GMT Sunday), affects 13,000 bars and restaurants which escaped a 1995 smoking ban on restaurants with more than 35 seats, as well as any other workplaces not covered by the previous law. Amanda Sandford of the pressure group Action on Smoking and Health (ASH) said there was currently no specific legislation banning smoking in the workplace or public places in the UK. 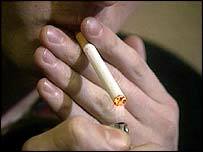 A British ban on smoking in public places would have a huge impact on health, she said. "The implication would be massive - there would be a dramatic fall in the number of heart attacks, lung cancers and respiratory diseases."